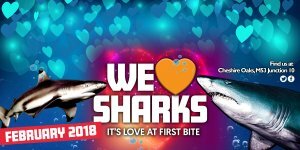 Our “We love sharks” event takes place this February and from Valentine’s day we’ll be celebrating our love of sharks. The caribbean reef section houses Europe’s largest collection of sharks, from Black tips to our enormous sand tiger and nurse sharks. With an interactive shark trail you can seek out all of our fabulous sharks, and there’s a chance to win an annual pass in our competition. We’re open 10-5 weekdays and until 6pm at weekends.